Welcoming over 80,000 audience members a year to their reclusive performing cove, seats at the Minack Theatre are carved from the rock face itself, with the environmentally-friendly alternative to pillows – i.e. grass – helpfully growing amongst the stalls. In the early 1930s, Rowena Cade and her fellow local drama enthusiasts aimed to create a small, secluded area in which their country troupe could perform a production of The Tempest. Moving individual boulder by individual boulder down the incline of the eroded cliff-face, the actors created a minute makeshift stage where they could enact their play, while still taking full advantage of the atmospheric ocean backdrop behind them. Eighty years on, the sight of struggling vessels in stormy seas and an unmerciful aquatic landscape remains the same as it did back then. 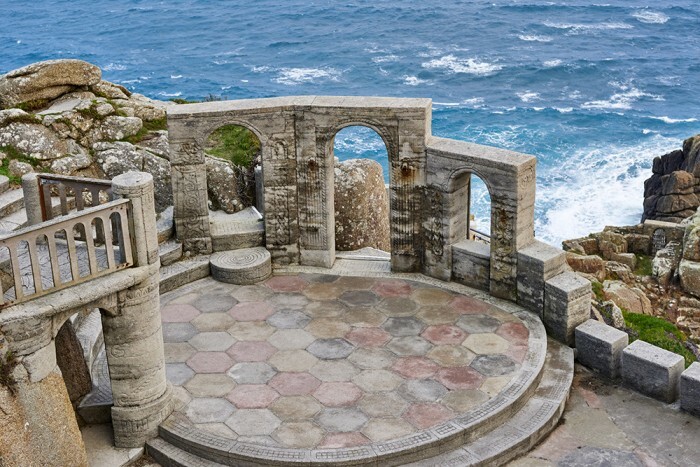 Open all year round, accepting an average of 150,000 casual tourists who come simply to marvel at the ingenuity of its design, the Minack is the jewel in the crown of the Cornish experience. In no other theatre is the fury of the surf a hindrance to a director. In no other performance space can the timing of the wild wind make or break the emotive effect of a monologue. Porthcurno’s worst-kept secret is the stuff of dreams, a playhouse virtually requiring an abseil to reach the front row. Not for the faint-hearted – or indeed any audience member with vertigo – the Minack merges the Bard with the bay, treading the boards with striding the beach, and with an eight-decade history securing its rock solid foundations into the popularity of thousands of theatre-goers every year, it can look forward to another multi-generational heritage to come.